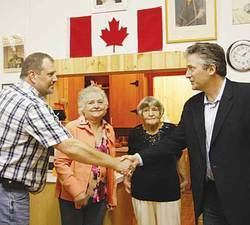 Oct. 4, 2013 8:00 a.m.
(l-r) Warburg Mayor Dawson Kohl, Warburg Historical Society Secretary-Treasurer Joan Sommer and President Susie Szepesi, and MP for Wetaskiwin Blaine Calkins celebrate the successful grant application for and installment of two furnaces and a hot water tank at the Warburg Museum. The $8,045 grant was made possible through the New Horizons for Seniors Program through Human Resources & Skills Development. Warburg Museum, located in a converted two-room schoolhouse adjacent to the present day Warburg School, is heating things up thanks to two new furnaces and a new hot water tank which were made possible by an $8,045 Federal grant to the Warburg and District Historical Society (1994). The funding program is from the New Horizons for Seniors Program through Human Resources & Skills Development. Blaine Calkins, MP for Wetaskiwin, toured the museum and met with Mayor Dawson Kohl and the Historical Society officers and members, and community residents who drop by for the Museum’s celebrated pie and coffee each Saturday. Calkins congratulated the Historical Society on their successful application for the energy efficient furnaces that will help keep operating costs down while offering better service. He also thanked the Society for “keeping history alive,” noting the debt we owe to previous generations for their spirit, knowledge, and experience. The museum features historically accurate, staged rooms—classroom, bedroom, shop, and a kitchen, as well as display items in the basement and dining area—dolls, tools, uniforms, trophies, an impressive cast iron skillet display covering an entire wall, and so much more. Warburg Museum is open every Saturday from 1 to 4 PM or by appointment. Stop by and enjoy a slice of pie and a coffee for $4 before taking a step back in time. New members are always welcome. Please call Susie Szepesi or Joan Sommer for more information.